Blepharitis is a chronic inflammation of the eyelids and eyelashes affecting people of all ages. Seborrheic blepharitis is often associated with dandruff of the scalp or skin conditions such as acne. Among the most common causes of blepharitis are poor eyelid hygiene, excessive oil produced by the glands in the eyelid, bacterial infection (often staphylococcal) or an allergic reaction. Blepharitis can appear as greasy flakes or scales around the base of the eyelashes and a mild redness of the eyelid. It may also result in a roughness of the normally smooth tissue that lines the inside of the eyelid. 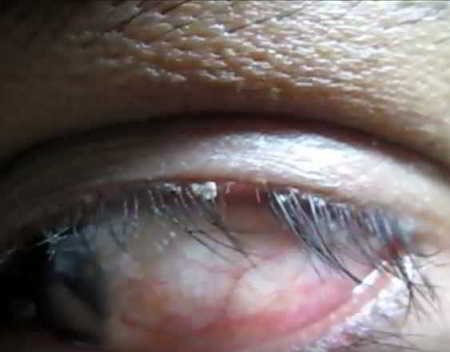 Ulcerative blepharitis is less common, but more serious. It is characterized by matted, hard crusts around the eyelashes, which, when removed, leave small sores that ooze or bleed. There may also be a loss of eyelashes, distortion of the front edges of the eyelids and chronic tearing. In severe cases, the cornea, the transparent front covering of the eyeball, may also become inflamed. If you experience symptoms of blepharitis, your doctor of optometry can determine the cause and recommend the right combination of treatments specifically for you. Mix warm water and a small amount of shampoo that does not irritate the eye (baby shampoo) or use a commercially prepared lid scrub solution recommended by your optometrist. Close one eye and using a clean wash cloth (a different one for each eye), rub the solution back and forth across the eyelashes and the edge of the eyelid. In cases where bacterial infection is a cause, eyelid hygiene may be combined with various antibiotics and other medications. In many cases, good eyelid hygiene and a regular cleaning routine may control blepharitis. This includes frequent scalp and face washing, warm soaks of the eyelids, and eyelid scrubs. Eyelid hygiene is especially important upon awakening because debris can build up during sleep. A 15% solution of MSM in isotonic saline was evaluated and found to be a soothing treatment for the eye following accidental injury due to particulate matter in the eye as dust or pollen.